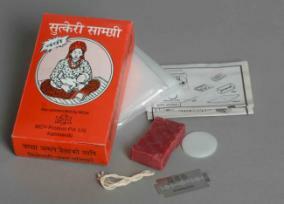 A birthing kit from Nepal. Childbirth remains one of the most risky times for women, particularly those giving birth in low and middle income countries. Every day more than 800 women die from conditions related to pregnancy and childbirth. Most of these deaths can be prevented if women are able to get access to interventions and skilled care. BU researchers in the Centre for Midwifery, Maternal and Perinatal Health (CMMPH) have been working to identify how a simple intervention – the birth kit – can be used to increase education and access to the essential commodities needed for a clean birth. Birth kits come in a variety of shapes and sizes. Most are simple, disposible kits that include items to facilitate a clean surface for birth, such as a plastic sheet, soap so the birth attendant has clean hands, a razor blade to ensure clean cutting of the umbilical cord and cord ties or a clamp. This kit pictured here, from Nepal, contains a plastic disk to provide a clean surface upon which to cut the cord, while maintaining the cultural practice of doing this over a coin for good luck. The BU research team, along with colleagues colleagues at Pathfinder International in Pakistan , the University of Aberdeen and the London School of Hygiene & Tropical Medicine, have developed a decision support tool for policy makers and programme managers to help them identify how birth kits can be distributed and used to improve care at birth.